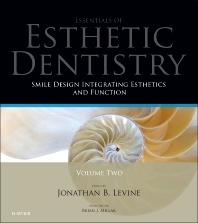 Jonathan B. Levine DMD presents a new volume designed to introduce practitioners to aesthetic dentistry with the goal of safely expanding his or her current scope of ethical dental practice. Richly illustrated in full colour throughout, this beautiful yet practical volume introduces the subject of smile design to the reader with topics ranging from aligners and veneers to space management. Smile Design Integrating Aesthetics and Function will be suitable for dental practitioners worldwide. Describes in detail assessment techniques for smile design, the use of trial procedures and the use of photography, aligners, and ceramic veneers. Highlights the way in which high quality esthetics can be achieved with a range of techniques. Jonathan B. Levine is the Program Director of the Advanced Aesthetics Program in Dentistry at NYU CE and Clinical Assistant Professor at the NYU School of Dentistry. He has almost 30 years of experience in dental practice in NYC where his high profile work has led to him being regularly approached by the media and health industries to provide medical advice and aesthetic insight. He is part of Doctor Oz’s panel of medical experts and a contributor to the Oz Blog. In 2011, Dr. Levine founded GLO Science - an oral health innovation engine commercializing inventions to build an oral health platform via a therapeutic device that also has cosmetic implications. Dr. Levine developed the GLO Brilliant Personal Teeth Whitening Device which received the 2012 Edison Award for innovation in a personal care product. Dedicated to contributing his professional services to humanitarian efforts, Dr. Levine founded the GLO Good Foundation, which supports oral health initiatives in underserved populations around the world. In addition, Dr. Levine is a board member of Foundation Rwanda, an organization that helps the children of the 1994 genocide, and serves on the advisory board of Health Corps, a national service and peer-mentoring initiative. Brian Millar is an experienced teacher of undergraduates and postgraduates and well-known provider of postgraduate education internationally at conferences through lectures, seminars, webinars and hands-on courses. As a Full Professor at King’s College London and NHS Consultant in Restorative Dentistry at the King’s College London Dental Institute at Guy's, King's and St Thomas' Hospitals he is the Programme Director for the internationally popular MClinDent (Fixed & Removable Prosthodontics) degree programme with 120 postgraduate dentists. He designed and set up the successful MSc programme in Aesthetic Dentistry and also the MSc Advanced General Dental Practice at the KCL Dental Institute. As a Specialist in Prosthodontics and in Restorative Dentistry with 35 years experience in both hospital and private practice, Professor Millar is particularly focussed on treating tooth wear, aesthetic and occlusal/TMD problems utilising non-invasive treatment where possible; he has also used ceramic veneers and tooth bleaching since 1983. Professor Millar has published over 150 papers, and supervised over 200 PhD and Masters students. His research includes management of occlusal problems using MI techniques, bringing together aesthetics and function with a focus on tooth preservation.